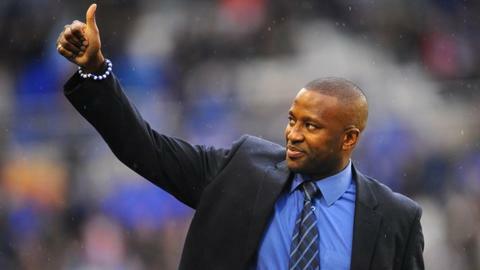 Lee Clark's sacking as Birmingham City manager was inevitable, says former Blues defender Michael Johnson. Clark parted company with Blues on Monday after two-and-a-quarter years in charge of a club in off-field turmoil. "I understand the circumstances Lee was working under," Johnson told BBC WM. "Nobody wants a manager to lose their job, but our home form has been woeful. "That was the driving force behind the club saying it can't go on any longer. The buck had to stop with Lee." Blues make approach for Robinson? Pat Murphy, BBC Radio 5 Live"I understand an approach from Birmingham City to MK Dons for permission to speak to their manager Karl Robinson was exploratory and that the issue of compensation quickly deterred Blues. "The three front-runners to succeed the sacked Lee Clark are Mike Phelan, Owen Coyle and Gary Rowett. Compensation wouldn't be a problem with Rowett, while both Phelan and Coyle are available, with no fee involved - a factor that appeals to Birmingham director Panos Pavlakis, who is charged with the responsibility of bringing in a new manager at minimal cost to the cash-strapped club. "An appointment is unlikely before the weekend." Blues' 1-0 home defeat by Championship relegation rivals Bolton Wanderers leaves them only a point clear of safety. "I was at our game on Saturday," added Johnson. "It wasn't great. There has to be somebody who is accountable. "When you look at the length of time he's been in that position, any other manager would have been gone a long time ago. The fans have stuck with him. "They had to try something or they could end up in the same position as last season." Blues only stayed up in May thanks to the injury-time strike by Paul Caddis at Bolton, which sent Doncaster Rovers down instead. Although the immediate task for caretaker management duo Malcolm Crosby and Richard Beale is simply Tuesday night's trip to Blackburn, even allowing for all the uncertainty over their off-field concerns, the managerial vacancy at St Andrew's still remains an attractive one. It was only in 2011 when they beat Arsenal at Wembley to win the League Cup - the last of the seven in nine seasons they spent in the Premier League. The list of likely contenders put together by the bookmakers to replace Clark already reads like a who's who of available managers. Michael Johnson, who now works as a club ambassador for Birmingham City, did not dismiss local speculation suggesting that one potential outside contender for the vacant hotseat at St Andrew's might be former manager and Blues legend, Trevor Francis, working with Johnson, another great fans' favourite, as his number two. Francis, sacked by Blues after five-and-a-half years in charge in October 2001, has not worked since leaving Crystal Palace in April 2003. But Johnson told BBC WM: "Whatever the club ask of me I'm more than willing to help. And Trevor would be somebody obviously I'd definitely recommend. "I've worked under him once before, when I had my best days as a player. Everybody knows the criteria he comes with as one of the greatest ever to play for Blues. And he would be a fantastic acquisition." Three of them, Trevor Francis, Barry Fry and Chris Hughton - who led City to the Championship play-offs in his one season in charge in 2011-12 - are ex-Blues managers. But Gary Rowett, a popular Blues player for two seasons under Francis from 1998 to 2000 - and a target for Blues' fellow Championship strugglers Blackpool last month - has already been installed as a short-priced joint-favourite, having taken Burton Albion to sixth in League Two. The bookies have also earmarked former Manchester United number two Micky Phelan, who spent time in the West Midlands when he ended his playing days with Blues' local rivals West Bromwich Albion. Another former Blues player Mark Cooper, son of former City boss Terry, is also expected to cross the board's radar, having steered Swindon Town to third in League One.